My character has a rigidbody and my panel prefab is on the resources folder. What should I do? 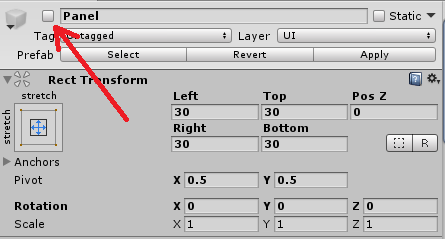 also add the panel on scene, as child of canvas (you probably already have a canvas on scene) and disable it, you know uncheck the upper toggle on inspector, and also drag & drop the panel on scene (from hierachy to inspector) to the public variable messagePanel like you did with the prefab (from assets to inspector). I did that but my panel is not showing. I've check it on the debug log if it is triggering then I got response. 628 People are following this question.